What is a USB connection? A USB (Universal Serial Bus) connection allows you to plug your phone or other media device to your car's infotainment system. It can be used for a variety of reasons, from listening to music, transferring media on to a hard disk drive (if fitted), or simply charging your mobile device. By plugging into the car’s USB port – usually found somewhere on the dashboard or centre console (sometimes in the armrest) – you can listen to music stored on your phone through the car’s infotainment system. In some cases, the car simply recognises that an external device has been connected and will automatically play, while others require you to select the USB connection from a list of different sources, usually in the "Media" part of the system. 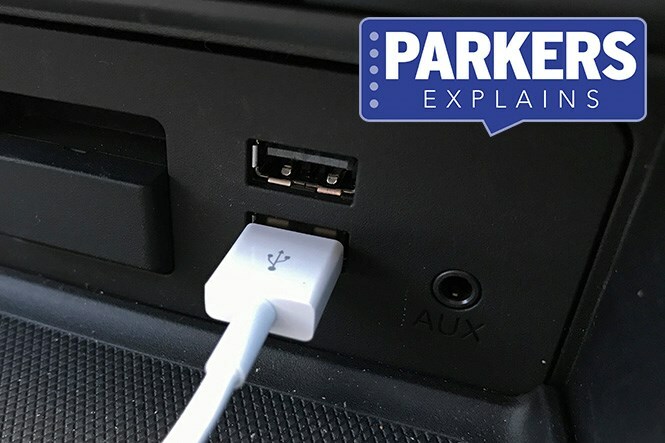 If the car is fitted with Apple CarPlay, Android Auto or MirrorLink, this is the means for making the connection – via the USB cable – and will boot up automatically for you to control via the infotainment controls. That depends on what you want from your car and how much you value being able to play music or charge your phone on the move, but you’d be hard-pushed to find a car on sale today that doesn’t come with a USB port, anyway. It’s an alternative to playing music via Bluetooth, but you can also use a USB stick with music loaded on to it rather than using your phone. Some cars also use this to load updated software on to the infotainment system. Pretty much every car on sale, from the Vauxhall Corsa to the Audi Q7. Looking for more jargon-busting motoring meanings? Head over to our Parkers Car Glossary page and take a look at our other definitions.